There were really nothing to see in Chinatown really. On the main road, there were rows and rows of stalls and shops selling the same kind of stuff you normally get in Chinatowns all over the world … knock-off watches, clothings, perfumes and what nots. I went around to look for Little Italy and true to what I had read, Little Italy is nothing more than a short street of some Italian restaurants. The Chinatown had encroached into Little Italy so much that if I did not already know I was there, I would never had known this is Little Italy. It was beginning to rain heavily … so heavy that I did not take out my camera to take any pictures while there. Since it was quite late already and the only thing I had since morning is a bagel and a giant pretzel, I thought it’s time for some food. It was in Bowery Street that I saw what really appealed to me in this cold rainy weather … congee. The restaurant I went into was just simply called the Congee Chinese Restaurant. They have a really extensive menu. I find that the Chinese restaurants in the US (for example San Francisco, New York) have bigger menus than what we have in Vancouver. It had also a wider variety of menu items. In this restaurant, their congee menu is quite extensive … and have quite a few unique types that you normally don’t find else where. 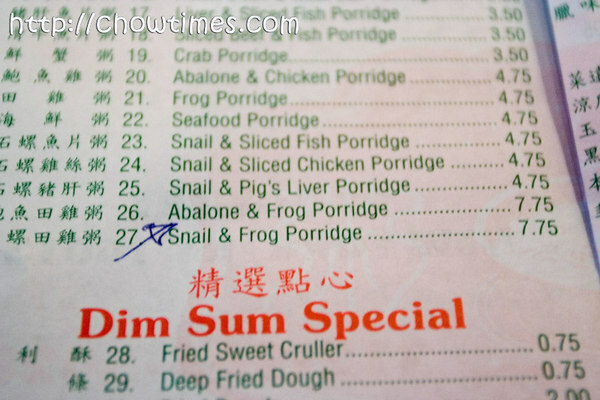 I ordered the Abalone and Frog Porridge. The porridge is served boiling hot in a hot pot. With a few dashes of pepper and soya sauce, this pot of congee was just what I needed. Besides warming me up, I had not had real chinese food for the past few days. Moreover, my feet is killing me. I stayed in the restaurant for over an hour and took my time reading and planning for my trip the next day. 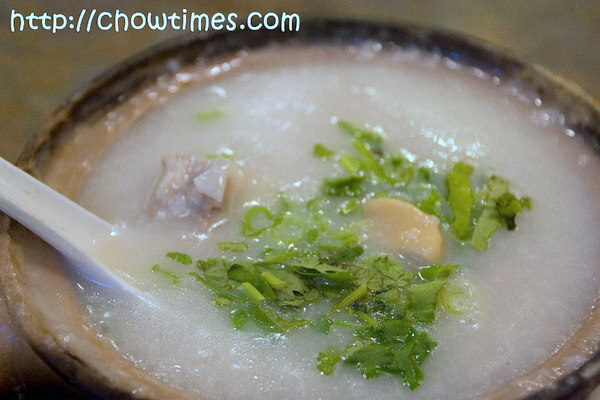 mmm… i love congee, except my family calls it jook! maybe it is cantonese? idk. abalone and frog though? damn… i stick with chicken. lol. 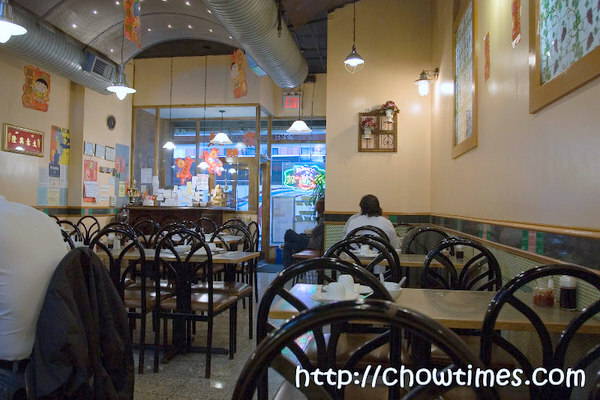 Chinatown is a spot where people who want to eat Chinese food to go to. It’s not about seeing things or etc. It’s the food! Can’t help but notice you’re in NY. If you have time try going to the Carnegie Deli, they have amazing sandwiches that are literally a foot and a half tall. Google some images and you’ll see how magnificent they are. They are a lot of money ($10-15 per sandwich) but you will get your money’s worth and it is very hard to finish one by yourself. Also if you’re still hungry they have amazing cheesecake as well. I had the same impression from NY Chinatown. Used to the small Chinatown in the Netherlands (where we do not have shops with knock of price watches and clothing) with Chinese supermarkets, giftshops, phone stores and restaurants, I was expecting a bigger version of this in NY.. and not the fake handbag stores or lame chinese souvenirs. Though, I think the price is pretty good compared to European prices. Chicken congee in Amsterdam will set you back 7 Euro’s (10 USD) a bowl. That’s 5 times as expensive.. sigh..